As several of us Salties approach or surpass that big 3-0, I was thinking if there’s something about the 30s that leads to our peak running performances. Is it the age, itself? Or something else? I decided to investigate. Do us non-elites tend to peak a bit later in age, too? I think we do, but I think it has more to do with life experiences, especially in the longer distances like the marathon and ultras. Here are some thoughts on the matter. Childbirth: Because 26.2 is chopped liver. I’m not speaking from experience (Chime in here: Salty? Mint? Bueller? ), but theories exist that say child birthing and the pain of having an a grapefruit-sized head come out of a Cheerio-sized opening pretty much desensitizes the body from other, perhaps more tolerable, pain. Placing one foot in front of the other and remembering to breathe might not seem as daunting after the birthing experience. While preggers, women become progressively more pain tolerant. Natural painkillers, like endorphines, elevate and help get one to the finish line, pun intended. Once giving birth, do the endorphins stick around? Is the body more accustomed to kicking into that mode and making you more tolerant of that inevitable painful last few miles? Kara Goucher explained how the last 8 miles of the 2012 Olympic marathon was actually quite similar to what she felt in childbirth. The cramping that crept up her right calf and into her back felt familiar. Was she able to keep going though, despite the driving rain and pain, because she had been through worse? Giving birth in fall of 2010 to her son, Colt, was no easy feat, with 15 hours of labor. Kara leading the women’s pack just before 24 miles. Did childbirth make her even stronger? (Photo credit: Mikenan1). The mental toughness that comes with life experience. I don’t know of may 14-year-olds that run marathons – besides Winter Vinecki, of course. Dominating endurance races takes tenacity and mental toughness. I’m not saying that teenagers and 20-somethings don’t have the mental capability, but I am saying that life experiences enrichen one’s determination and tolerance. Job rejections. Speeding tickets. Deaths in the family. Mean people. Bad break-ups. The longer our life, the more ups and downs we experience and the same is true with races. Your skin gets thicker as the years go on, and your ability to stick with it when the going gets tough in a race, seems to follow suit. I remember getting so nervous before cross county and track meets when I was younger and being so jealous of the parents who were there just hanging out as spectators and not having to deal with the pressure of performing. I’d literally go to the bathroom 15 times before the third and final call and distinctly remember having to have the school bus pull over as I dry heaved before a regional meet! I was mortified! Oh, if I knew then what I know now. Even in college, each race seemed like such a HUGE deal, and I was so worried about what others thought if I didn’t run my best. Now, I run for me. That came with age. That’s me (4th place) when I still let nerves get the best of me. I don’t know about you, but as I’ve experienced more of life, racing and pushing myself to my own potential are little treasures in a life full of work, money and just “adult-life-in general” types of stresses! Running a marathon is all about ME! Don’t get me wrong: I still get jittery before big races and sometimes have a hard time getting down my pre-race peanut butter bar, but I have a greater perspective nowadays. It takes a while to get the nerves under control and feel confident, especially in a 3+ hour-long race, but after a while, it becomes more natural. Timing is Everything. 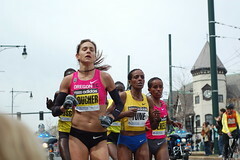 As Tirunesh Dibaba, Shalane Flanagan, et. al. demonstrate, it’s probably not their age, but rather a product of their career path. All these women first found enormous track or cross country success, running the shorter distances. As they peaked in one distance, they moved up to the next. Additionally, it typically takes a while to perfect the marathon distance. If an athlete makes her first attempt at age 25, it may take 10 marathons and five years of practicing before hitting that personal record, surpassing that 20 mile bonking point, and learning that Raisin Bran does not fare well with the marathoning digestive tract. You really can’t prepare for the feeling of hitting the wall for the first time in a marathon; you’ve gotta experience it yourself. How many marathons does it typically take to peak? I’ve run six marathons- the first when I was 23 and the last at 27. My fastest was a 3:19. From there, my times actually got progressively slower. It may have been because three of them were in Boston, where Heartbreak Hill, well, broke me and I bonked two of the three times due to nutritional reasons related to my eating disorder. But that’s pretty unique to me. For most runners, it seems, the opposite happens: with each marathon, your time gets a little faster. How many marathons did you race before your peak performance? Like with other things in life, practice makes perfect, right? It takes fine tuning and systematic training to perfect a race. From incorporating Yasso 800s to fighting the bonk, how many years should one race before reaching her peak? Along the same lines of timing being everything, it seems veteran runners are, in general, more successful in dominating the course. Obviously, there’s a fine line of when years of training work in your favor and years of aging begin breaking down the body and muscle mass … not to be a Debbie Downer or anything! So what do you think? Is it just coincidence that the world’s best marathoners tend to be in their 30s? Or does it more so have to do with life circumstances? When did you peak at 26.2? Or are you still waiting to break on through? Hey there! It sounds like your story goes right along with my theory (as unscientific as it might be) of life experiences improving us as runners! I’m rooting for you to keep dropping that marathon time – pretty awesome. What do you think about the whole child birth thing? Thanks, Mint! I don’t know what I think of the birth thing since I was not a distance runner and did not race when I had my kids. I ran a couple of times a week, but I didn’t start racing and distance until several years later. Plus, I had c-sections for both of my babies. So I am no help to you there! I do, however, buy into the idea that hormones and hormone changes will affect performance. And I LOVE watching women bounce back from having a baby with great races. First, Meggie, I didn’t know you were blogging! I just saw you post this on FB and was very intrigued by the comparison to wine :). Anyway, I think there’s a lot of truth to what you’re saying and I think a lot of it has to do with hormones. When I got into distance running about 5 years ago, my then boyfriend gave me a book that was all about running for women. One of the chapters was about running and pregnancy, and while I don’t ever plan on going through that I was intrigued. The author wrote about a lot of elite runners achieving their marathon PRs within a year after giving birth. Part of that may tie in with what you were mentioning about Kara and being accustomed to pain, but I think some of it comes from the change in hormones a woman experiences after pregnancy, particularly if she breast feeds. For many of us, hormone levels can start to change as we approach 40 (doesn’t a woman’s sexual drive start to peak around that point, too? ), and I think that has a big impact on our ability to performance in distance running. I had all three “cheerio style” (ha!) I am still not sure how it affects running, especially if you go in and get an early epidural, just the pushing is probably hard. A non-medicated labor and delivery, is intense and definitely puts racing pain into perspective! I personally don’t feel like I’ve ever experienced a post-baby bump in fitness. All three times now, it’s been a months long grind before I got back into shape and then I haven’t gone much beyond where I left off. But that’s my experience and I haven’t exactly given myself much time in between pregnancies either. Also, I’m on the older side for having babies which might make a difference. When can a female athlete peak? The best predictors of a runner’s performance are the athlete’s running economy and lactate threshold. 1. Running economy is the pace you can run at your V02max (aerobic capacity), how efficiently your body uses oxygen measured in mL/kg/km. 2. Lactate threshold is the speed at which a runner can perform after reaching their anaerobic threshold (muscle fatigue, soreness). So Ginkgo, your theory about the experience of child birth contributing to a runner’s improvement may have some relevance. Maybe the process of pushing through the pain of child birth improves a runner’s ability to push through pain when training, increasing the lactate threshold. Hmmm. But, influencing these two above predictors is our aerobic potential which does decline with age known as the V02 max, cardio-respiratory capacity (Fick Equation), measured in mL of oxygen per kg/min. The age related decline begins at age 25 by about 10% per decade. The rate of decline can be slowed by high intensity training for sometime which may explain why female athletes can perform well into their 30s and 40s. The ability to slow the decline drops off after menopause which may be related to estrogen effects and change in lean body mass (muscle loss). Men have a similar drop off after age 50. I plan to run forever and peak each decade.